If you’ve had any sort of interaction with the SCAQMD, you already know that the agency has some of the most stringent air regulations in the nation. And if you review data on the region’s air quality, you’ll see that these stringent regulations are making an impact, with far less pollution than in the middle of the last century, when on some days, the smog was thicker than Anderson’s pea soup. We’ve made great strides, but we’ve still got a ways to go. One of the areas the SCAQMD still wants to improve is the reduction of NOx and VOCs. Yes, we scientists and engineers love our lexicon, so for those of you unfamiliar with these terms, they stand for nitrogen oxides (NOx, pronounced “knocks”) and volatile organic compounds (just say the letters: V-O-C). 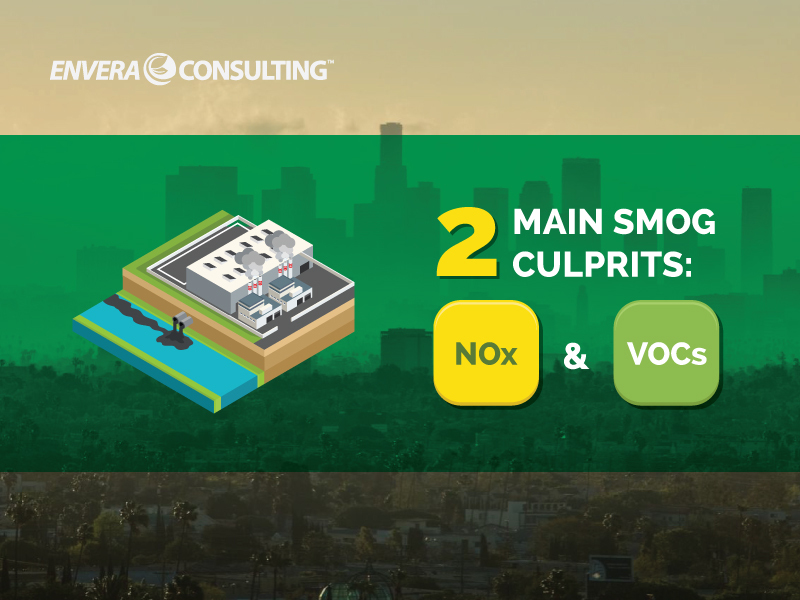 NOx and VOCs are two of the main culprits behind ground-level ozone, that brownish hue that you see in the sky, particularly when you look at mid-1900s photos and videos of Los Angeles. On their own, NOx and VOCs aren’t so terrible. But combine them with sunlight and you’ve got the recipe for ground-level ozone, which is really just a fancy term for smog. Since we live in Southern California, there’s not much we can do about the sunlight part of that equation. So in order to prevent ozone, you’ve got to start by regulating the precursors — the NOx and VOCs. VOCs are ubiquitous. They’re found in almost every type of manufacturing plant and almost anywhere that deals with gasoline. (That’s why you’ll see signs at gas stations telling you not to top off your tank — it causes excess VOC emissions.) Industrial paint thinners, degreasers, and paints are also major VOC culprits. And, believe it or not, some bakeries have high VOC emissions due to yeast. A lot of NOx emissions, on the other hand, come from fuel combustion, such as vehicles (of which SoCal also has more than its fair share) and industrial burners such as the kind used at bakeries, refineries, and manufacturing plants. Some sources say that up to 80 percent of NOx emissions in SoCal comes from vehicles. The SCAQMD’s already stringent NOx-emission regulations seem to get tighter with every passing year, with new guidelines for using low­-NOx technology and installing control equipment. Rule 463 aims to control the VOC emissions from large storage tanks. Rule 1147 focuses on NOx emissions from equipment that isn’t regulated by RECLAIM. Rule 1168 does pretty much the same thing for adhesives. Rule 1178 sets limits and guidelines for storage tanks at petroleum refineries.